In this third post about the Pascola masks of Jesús Rodríguez Muñoz, I will show a few more of his danced masks, to expose you to some of his other design features and variations. The first of these masks, which was attributed to Jesús by his relatives, has a canine face that seems almost Cubist (and conical) in it’s shape and style. It was collected by Barney Burns and Mahina Drees in 2006 (B/M 100). As one finds frequently for this carver’s danced masks, there is no forehead cross. This series of posts about Yoeme (Yaqui) Pascola masks began on July 4, 2016. Today I will continue last week’s discussion about the masks of Jesús Rodríguez Muñoz. I will start off with an undanced and apparently made for sale mask with a human face that I found on EBay™. The major added embellishments were plastic jewels. Inlaid mirror elements also enhance this mask, but such inlay work does not represent a new novelty addition, as mother of pearl inlays were traditionally used on documented masks from the early twentieth century, and these gave way to shapes cut from glass mirrors and then from plastic CDs in recent decades. Last week you saw a danced clown with inlaid plastic jewels that created the appearance of tears. To add to the confusion, the white triangles under the eyes on a Pascola mask are also referred to as tears. This is a rather nice mask, with many traditional elements. You were introduced to the masks of Jesús Rodríguez Muñoz in my introductory post about Barney Burns and Mahina Drees. There you saw his mask of a bat with prominent fangs. 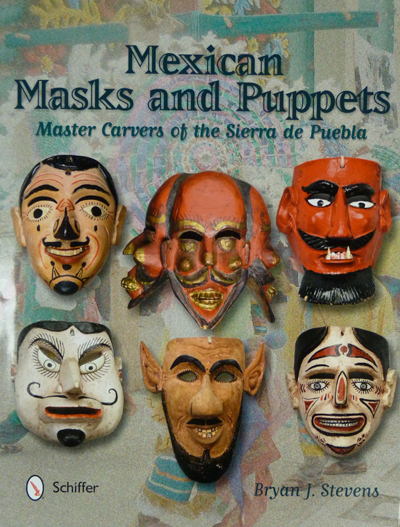 Today I will begin to compare made for sale masks that were carved by Jesús with some danced examples. 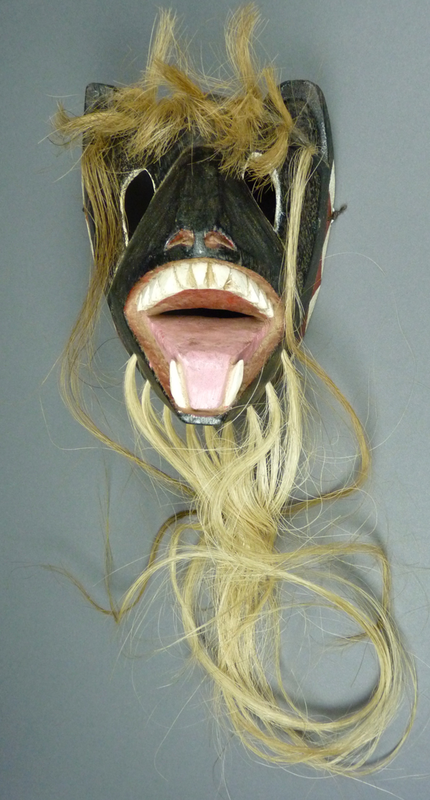 Today’s made for sale masks portray beings from the desert world, beings that are not portrayed by traditional masks, and then we will examine a danced mask with some similar features. I will begin with what appears to be a mask of a butterfly. You saw it here first! One hint that this is a butterfly is that the forehead cross has the form of a flower. But my eyes are on the proboscis tongue. 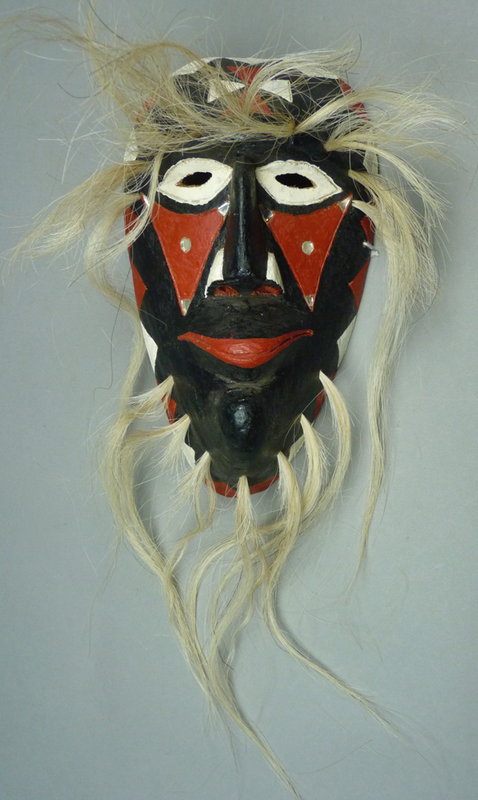 This carver often neglects to provide a cross on his danced masks, while supplying his made for sale masks with forehead crosses that are unusual. In this respect he appears to cater to these two different markets, but otherwise not so much. Today I will compare made for sale and danced human faced masks by a Yaqui carver, Rodrigo Rodríguez Muñoz, beginning with one that I showed two weeks ago. Later I will end with a goat faced mask by Rodrigo. I purchased this mask in June, 1999 directly from Barney Burns and Mahina Drees. They had obtained it one year earlier from the carver. There is much about this mask that is typical of Rodrigo’s style, whether he was carving for traditional use or for sale to outsiders. For example there is the flat upper surface, the cross painted there, the rim design, the eyes, and the triangles under the eyes. 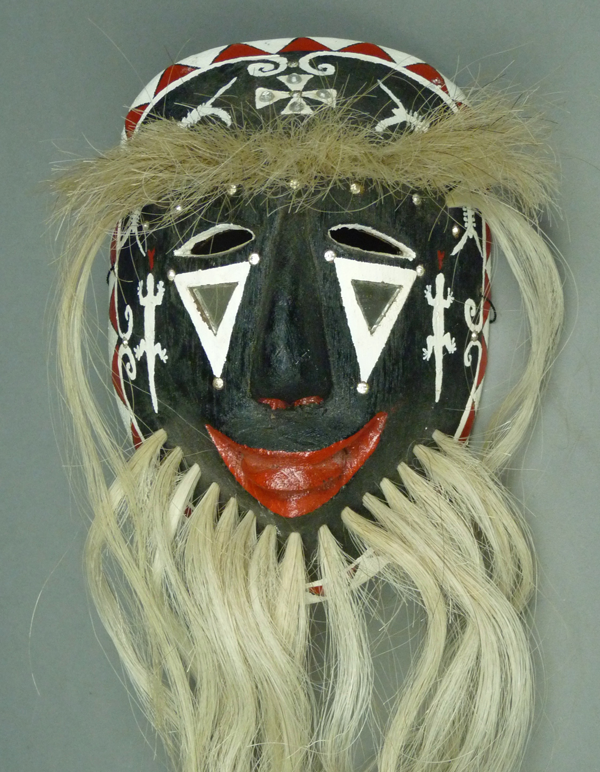 What is missing from this mask, compared to the danced canine masks in last week’s post and the danced human faced and goat faced masks that follow is the dynamic vigor found in the carving of those masks, as well as the simplicity of ornamentation. In other words, these made for sale masks are carefully carved, they have attractive decoration that they share with Rodrigo’s dance masks, but they lack the exaggerated mass or power of those intended for dancing. They almost seem two dimensional, compared to the danced masks.